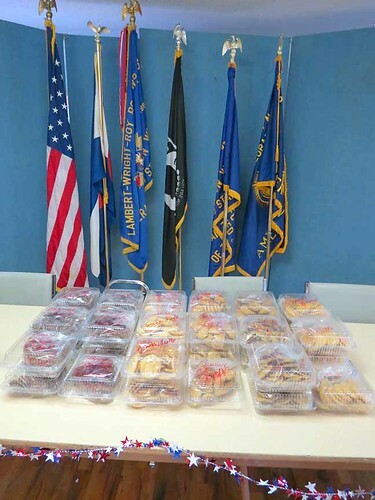 For nearly a decade, the Troop Support Action Committee (TSAC) has done a Bake-a-Thon of Christmas cookies for the "adopted" troop units we are supporting. In the "early days" of TSAC, baking was done in private kitchens. In the last few years, VFW Post 8661 has graciously allowed us to use the Shawnee Community Center and their large commercial grade ovens. The two ovens there make a huge difference in the volume of cookies that can be made in a relatively short time. This year TSAC had 15 members and guests who worked from after clean-up of the Famous Breakfast on Sunday until a bit after sundown. The rest (L-R) are pinecammers bdogsgal, Lo-bay Lady, dieselpop1, and MellowYellow. 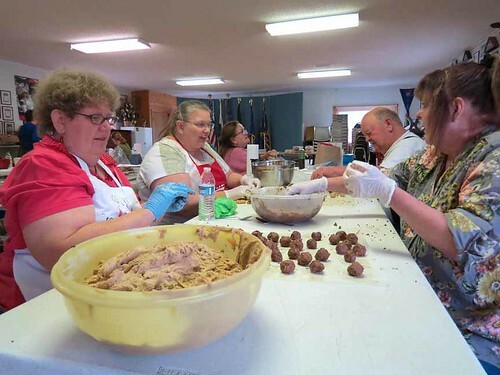 They are busy rolling cookie dough into balls that will head to the oven for baking. 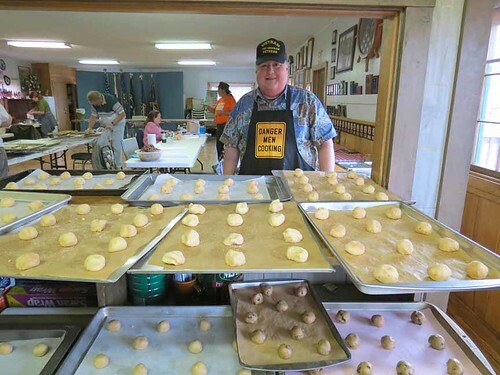 Here is mountainvet arranging cookie sheets for their turn in the ovens. (Not seen) is Jo-Mama slaving over the ovens keeping the baking process from turning into the "burning" event! The cookies seen on the trays range from "snickerdoodles" to "hermits" with Toll House chocolate chip, peanutbutter, and oatmeal raisin cookies on the way. After baking and cooling, the cookies were sorted by type and packaged into gallon ZipLoc bags. After bagging the cookies, they are placed in plastic cookie shells donated by King Soopers in Aspen Park. These shells give the cookies a chance to arrive in Afghanistan looking more like cookies than crumb dust! Here are 33 shells packed and labeled with 30 cookies in each. When all was done, there were 56 shells packed into eight "egg" boxes. Available space in the boxes were stuffed with signed Christmas cards and hard wrapped candy. 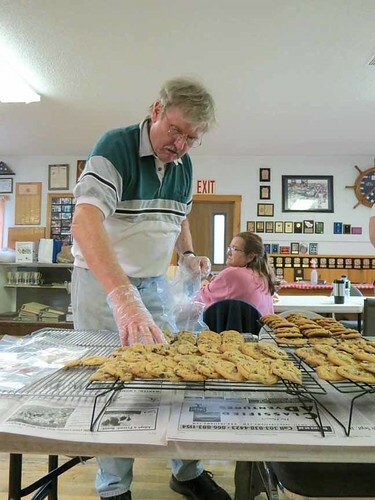 There were just over 1,700 cookies baked and packed last Sunday! These ought to bring a pack of smiles to our soldiers! 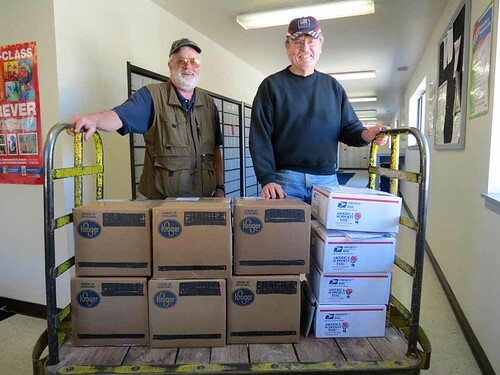 Here is BeerGodROX and RailBuf at the Bailey Post Office on today with six of the cookie boxes and four APO Flat Rate boxes loaded with other snacks and toiletries. This shipment weighed in at 129 pounds! Most of these boxes should arrive in Afghanistan in 10 to 16 days. TSAC is planning to display at Cowboy Christmas in Rustic Square on December 2nd. Please try to bring your children for a visit with Santa and enter to win Christmas turkeys that will be given away every hour. This is a fun event that has drawn eager crowds for years! TSAC is a "small charity" under IRS 501(c)(3) and donations are tax deductible. Goodies for the Troops can be deposited in the collection boxes at our local King Soopers or Safeway. Thanks for Supporting Our Troops!